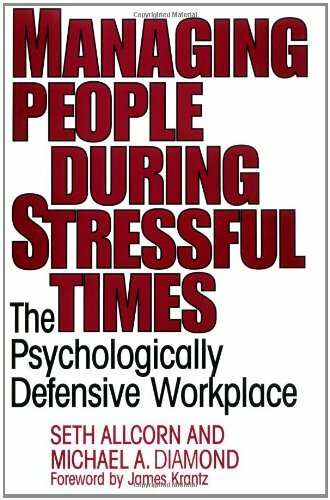 challenge readers to think systematically about the psychological side of the workplace and to understand the importance of dealing effectively with employee defensiveness. The result is an authoritative study with valuable lessons and immediate benefits for corporate executives, and for scholars and researchers in organizational behavor in the academic community. Allcorn and Diamond's model is applicable to understanding five aspects of the workplace: first, how individuals respond to its stresses and anxieties; second, the psychologically defensive nature of interpersonal relationships at work; third, what the psychologically defensive group processes are; fourth, the dynamics of psychological defenses; and fifth, how the model is used to understand the connection of all organizations to the larger society in which they are imbedded. The authors' goal is to help management understand what actually is going on in today's workplace, the consequence of downsizing and other cost-reduction initiatives, and how important it is for management for relieve the problems they cause. Michael A. Diamondis Professor of Public Affairs, Associate Director for Academic Programs, and Director of the Center for the Study of Organizational Change at the Harry S Truman School of Public Affairs, University of Missouri. He is a founding member and past-president of the International Society for the Psychoanalytic Study of Organizations. nbsp; Seth Allcornis Vice President for Business and Finance at the University of New England. He is a founding member of the International Society for the Psychoanalytic Study of Organizations.